Trade and industry minister Dr Rob Davies addresses delegates at national special economic zones conference in Durban. PHOTO: Supplied by the department of trade and industry. To date, the trade and industry department has designated ten special economic zones. 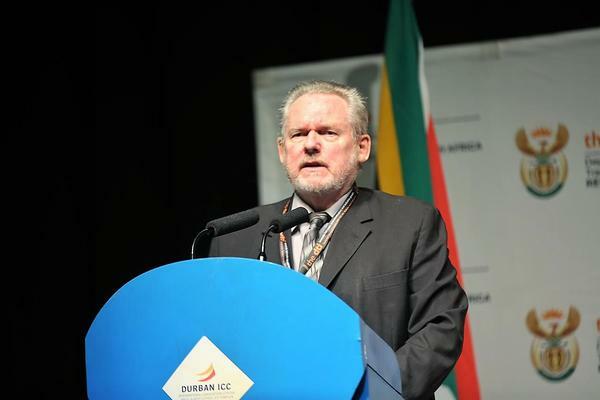 South Africa’s special economic zones programme has reached its full implementation stage, with 115 operational investors ploughing in over R16.8 billion, said Trade and Industry Minister Rob Davies. While at the first national special economic zones investment conference hosted by his department in partnership with the KwaZulu-Natal department of economic development, tourism, and environmental affairs, Davies said these companies had created 15,716 direct jobs. Davies singled out the Dube TradePort zone which has attracted 35 investors with R1.5 billion, creating 3,246 direct jobs. In the 2017/18 financial year, the zone yielded 429 new direct jobs and 974 construction jobs. In 2012, the Coega SEZ had 19 investors with a total private sector investment value of R1.13 billion, which resulted in 3,778 new jobs. To date, the zone has grown to 43 investors who have put in over R9.93 billion.